This entry was posted on Tuesday, July 9th, 2013 at 11:31 pm and is filed under Commercials and Video. Tagged: Batshit Crazy, Coffee, Cumberland Farms, David Hasselfhoff, Farmhouse Blend, Iced Coffee. You can feed this entry. You can leave a response, or trackback from your own site. 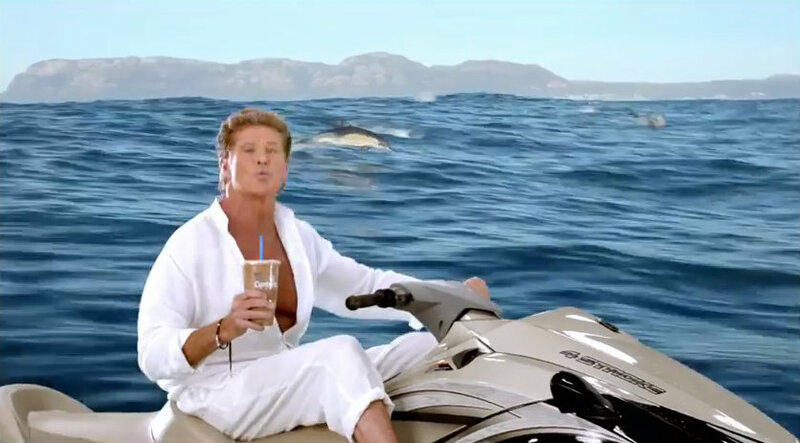 I actually like the commercial, it’s catchy and the “HOFF” pulls it off! You can’t help but watch it and that friggin’ tune stays in your head! Believe it or not Hasselhoff was a big star over in Europe back in the 80’s, they love him. We should look as good at his age. Oh yeah, the coffee is pretty damn good! « Q: How Does the Bear Catch Trout?